Should we invite the unsaved to church? 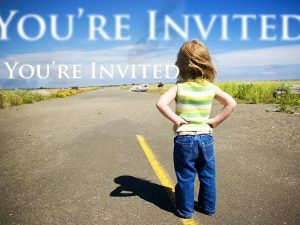 Since I practice church invitations as a tool in my personal evangelism habits to help people discover the grace of Christ, I want to examine the biblical evidence in support or rejection of this practice. My point in this series is to look at the gatherings of the early church in the book of Acts to see if there is any clear evidence one way or the other. Knowing that Acts is not written to answer my question, I have to draw conclusions from interpretations. Part 1 of this list is here. All Scriptures cited are from the NIV. The selection of the first deacons is a gathering of the disciples to solve a leadership problem. There is no preaching or worship indicated, but there is prayer and the setting apart of the first 7 deacons. The only people talked about in this passage are the believers. The believers are collectively called “the church in Jerusalem” but the term is not used to describe a gathering or meeting, but the believers themselves. Philip preaches to crowds who gathered to hear the word of God proclaimed. Was that “church” or a meeting in the public square? Were some of the believers with him to help him in the preaching, interceding for him, church ushers as crowd control, or was Philip all by himself? Could this have been an assembly with non-believers present, or would this be considered something else besides a church gathering? This is the story of Simon the Sorcerer. I’ve seen this passage used to justify a believers only assembly, so I’ll share my observations. Philip had been preaching the word of God in power ministry before the crowds. Simon gave evidence of conversion (Simon himself believed) and even took baptism and started following Philip (v. 13). This may be evidence of the exclusion of non-believers until they believe and become part of the group. It could also be said that Simon had not been interested in following the disciples and so would not have been part of the group until he got involved, saying nothing about the practice of a believers only gathering. When Simon saw that the Spirit was given at the laying on of the apostles’ hands, he offered them money and said, “Give me also this ability so that everyone on whom I lay my hands may receive the Holy Spirit. Peter and John had come to the city to investigate how Samaria had started receiving the word of God. It could be argued that Peter and John met with the believers collectively in one place as the church. It could also be said that Peter and John visited with smaller groups if they visited house to house and prayed with households or smaller groups individually. The rebuke of Simon, as well as the rebuke of Annanias and Sapphira could be seen as cases of church discipline. The point of Luke’s story is the focus on Simon, and the outpouring of the Holy Spirit in Samaria, not on describing in full details of one particular gathering of believers. There is no mention of the presence or exclusion of unbelievers in these gatherings in Samaria. I’ve seen the passage used to justify the exclusion of non-believers since the disciples would not let Paul join their meetings at first. But Luke gives the real motive – they were afraid of Paul. The man sent to persecute the church is now a believer? Unbelievable? Are you sure? Are the stories true? If we let him join our meetings, will he carry us away to jail? The exclusion is not about what Paul believes or doesn’t. The matter is about fear, as clearly stated by Luke. The incredulity of the disciples over Paul’s conversion gave them pause. I invite you to chime in with your thoughts. Please stick to the passages cited for this conversation. I’ve sent you the new link. Greetings brother! Just want to make an observation or two. In the first passage quoted the word says, “when the number of the disciples was increasing, the Hellenistic Jews AMONG THEM…” What does this mean? It could mean “of the disciples” or it could mean “in contrast to the disciples” as a distinct and separate group. Are we sure these Jews were believers? I think part of the difficulty in answering your question from the book of Acts point of view is that the church was very organic at this stage of her life. Paul does assume the presence of unbelievers in 1 Cor. 14. It would be like Jesus to love the widows of both the world and the church. I am persuaded that is what is happening here. Unbelievers were being loved with this service, so that the Apostles could be free to preach to them the gospel. You’ve made a good point about the “among them” phrase. There is no way we can determine the “belief” status in how Luke is making the description. It could be one, the other, or a mix. As to your other points, I think you are absolutely correct. So far, based on the initial chapters of Acts, it is impossible to declare with certainty that non-believers were excluded from the assembly. I’ll keep plowing away through the book of Acts. The issue at hand the fruit of a discussion I’ve recently had, so it drives me back to Scripture to examine my own practice of inviting my unsaved friends to church to hear the proclamation of the word. I am glad you are digging! I am glad you care whether or not you are doing things that please God or not. Many ministers in our culture do not care so much. From my perspective. God will certainly give you the answers you are seeking! I’ll keep digging for the purpose of being able to answer the “believers only” position that assumes way too much and is based on some conclusions that may not be entirely accurate. For example, I’ve read that the 1 Corinthinans 14 passage is a “rare exception” for a visitor to be there. That simply assumes facts not in evidence. We have no way to know if it was rare or common, except by guess. That passage doesn’t teach we shouldn’t invite or we should invite – it does however show we need to be sensitive to our visitors, no matter how they come.